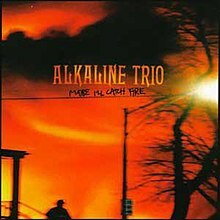 Maybe I'll Catch Fire is the second album by the Chicago-based punk rock band Alkaline Trio, released on March 14, 2000 through Asian Man Records. It was their final studio album for Asian Man and their last with drummer Glenn Porter, who left the band after its release and was replaced by Mike Felumlee as the band moved to Vagrant Records. By August 2008, the album sold 85,000 copies. Mike DaRonco of Allmusic liked the album, but less than the band's previous effort, 1998's Goddamnit, saying that "Lyrically, Maybe I'll Catch Fire follows in the footsteps of Goddamnit, while staying true to the elaborate but emotional tone of aggressive pop-punk. Not as essential as the Trio's previous efforts, but it would be difficult for any band to follow up an album like Goddamnit". All tracks written by Matt Skiba, Dan Andriano, and Glenn Porter. ^ "Alkaline Trio: Maybe I'll Catch Fire: Pitchfork Review". Pitchfork. Archived from the original on August 16, 2000. ^ Travis Mitchell. "Alkaline Trio: Maybe I'll Catch Fire". PopMatters. ^ a b c DaRonco, Mike. "Maybe I'll Catch Fire Review". Allmusic. Retrieved 2009-11-25. ^ Kelso Jacks (April 10, 2000). "REVIEWS". 62 (661). CMJ New Music Report: 22. ISSN 0890-0795. This page was last edited on 25 October 2018, at 05:38 (UTC).